This entry was posted on September 8, 2015 by Texas Safety Supply. The 3M 8212 N95 Respirator Breathing mask is a good choice for welding or soldering applications where metal fumes may be present. This n95 Respirator mask has the 3M Cool Flow Valve and more can be learned about the 3m 8212 n95 respirator from the 3M web site. 3m Technology incorporated into the Breathing valve in the respirator allows for easier breathing and can allow operation for longer periods of time when weather conditions are hot and humid. The 3m 8514 N95 Respirator is another workplace favorite when N95 Breathing protection is needed from non oil based particles that could pose a health risk for employees working in those conditions where breathing hazards are present. The 3m 8514 disposable respirator is another good choice when applications with metal fumes present. 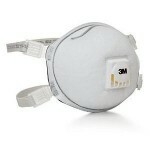 The 3m8514 Respirator has a carbon layer within that ehlps filter harmful vapors. 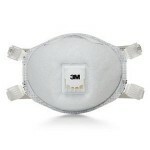 The Carbon layer in the 3m 8514 Mask reduces the users exposure to harmful vapors. An added feature is the added capability of being flame resistant in working conditions where this could provide risks. Added benefit that it has soft interior foam that makes it easy to wear for long periods combined with the easy exhalation valve allows the user to use for extended periods maintaining higher levels of productivity. More information is available regarding the complete specs of the 3M8514 respirator mask. 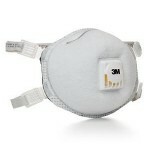 This N95 Respirator mask is for use when N95 breathing protection is needed. Super lightweight and ideal for hot working conditions make it a favorite of many working in the Southern and southwestern parts of the United States because it's a Lightweight breathing mask that is still sturdy and capable to hold up during hot and humid working conditions. 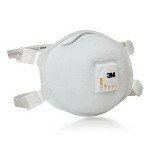 An N95 mask so for use when Non Oil based particles are present and pose a breathing health hazard. 3m quality and technology make again a favorite for those in welding operations and other scenarios where metal fumes may be present and can be filtered by a disposable N95 respirator. The filter is cake resistant while filtering out those fumes so it can hold up and last longer. 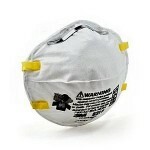 More iInformation on the 3m 8214 N95 Respirator. 3m Technology at work with the 3m 8512 N95 Respirator mask with it's advanced electrostatically charged microfiber designed for ease of breathing. Another solid choice for N95 breathing protection when oil based contaminants are not present. A soft nose foam and adjustable straps make it comfortable for those needing welder breathing mask protection. Many adjustments with the Noseclip and headstrap to give each user a uniquely comfortable fit. Understood with the use of any respirator is proper fit and use instructions provided on the packaging or by contacting 3M; WARNING: These respirators help reduce exposures to certain airborne contaminants. Before use, the wearer must read and understand the User Instructions provided as a part of the product packaging. In the U.S., a written respiratory protection program must be implemented meeting all the requirements of OSHA 1910.134 including training, fit testing and medical evaluation. In Canada, CSA standards Z94.4 requirements must be met and/or requirements of the applicable jurisdiction, as appropriate. Misuse may result in sickness or death. For proper use, see package instructions, supervisor, or call 3M OH&ESD Technical Service in USA at 1-800-243-4630 and in Canada at 1-800-267-4414.